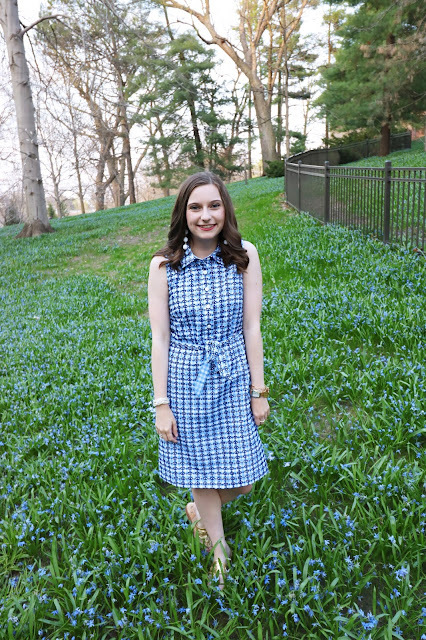 Sew Cute: Back to College: Sorority Recruitment Advice! Hello and welcome back to my Back to College series! Today's topic is the intimidating idea of rushing a sorority. Rushing my sorority was one of the best decisions of my entire life! So of course I want to help everyone find their dream sorority. This post can be your go-to guide for advice to have a successful recruitment week! First off, let me tell you the basic information you will need to know. WARNING: Every school is different when it comes to the rushing process! But these are just tips and things I have learned from my recruitment experience. The first day is mostly introductions and conversations. Usually they are just trying to get to know you. The rest of the order of the days depend on your school usually. But, one of these days will include a philanthropy day. On this day they will tell you about their annual philanthropy events, what cause they stand for, and what organizations they donate too. Also, one of the days they will discuss a little bit about dues and the cost of membership. Another day will include a house tour (if your school has facilities for their chapters) then a sisterhood themed presentation. Whether that be a powerpoint or a skit! Basically this day is the most casual. At my school you are given a t-shirt and you can basically wear whatever bottoms of your liking. My only tip is dress comfortably and appropriate. Don't wear you high waisted shorts that show your booty because that is not what they want to see! Save them for a weekend out :) then also wear comfortable shoes. Most of the time the first day(s) is the most walking if you are touring houses. I wore a pair of cute colored sneakers and was perfectly fine all day! Next day is usually just a casual dress. I would even say you could pull of a romper if you felt daring! Just something cute, but casual, and put together. Next day simply wear a dress a little more conservative then the dress before. 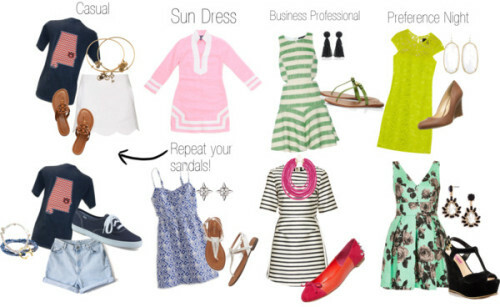 This day is more dressy so go with a pair of wedges, flats, or nice sandals (stay away from rubber flip flops!). Usually they will say wear business casual or professional or something of that nature. This night is the fanciest! Wear a fun cocktail dress that you have worn to a previous event. On my preference night I wore my graduation dress from high school so that is always a good option! (That is if you liked that dress lol) But for this night wear heels for sure. Tip: You can bring shoes you can slip on and off and just change when you get to your house or destination. Most of the time you have to keep your bags outside of the house so you can simply leave them out there! Here are examples of possible outfits you could wear each day. The first row is more preppy and my style and the second row is a little less preppy options. They key to all of these outfits is to show your personality and style. If you dress edgy don't wear something super preppy. Stay true to yourself. It's no different then acting different if you dress different. BE YOURSELF :) Because you want the girls to see you in what you are comfortable in not something you think you should wear. Tip: Dress according to the weather! If it is going to be hot, plan accordingly. When I rushed it was about 93 degrees out. Holy hotness! So dress accordingly. That includes hair products, I suggest a face primer for your makeup, also deodorant! Rush is usually pretty long days and by your last house you will look ratchet. But it is okay because EVERYONE will look ratchet. Even the girls sitting inside. No worries. 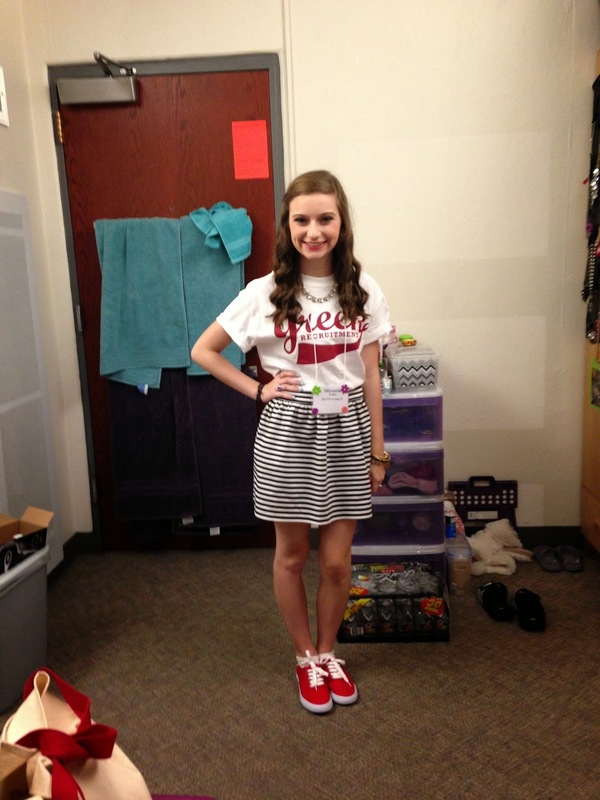 Here is what I wore during recruitment! I totally forgot which days I wore the dress and then the skirt and tank but this gives you a general idea. This is what I paired my t-shirt with! I HATE wearing t-shirts so I tried to dress it up as much as possible (if you couldn't tell). You can be way more casual then this but I just wanted to be extra dressed up. I'm actually in love with this outfit. If it is super hot outside I suggest a fun sock bun like this. My hair + humidity= no. So this saved me a lot of frizz! 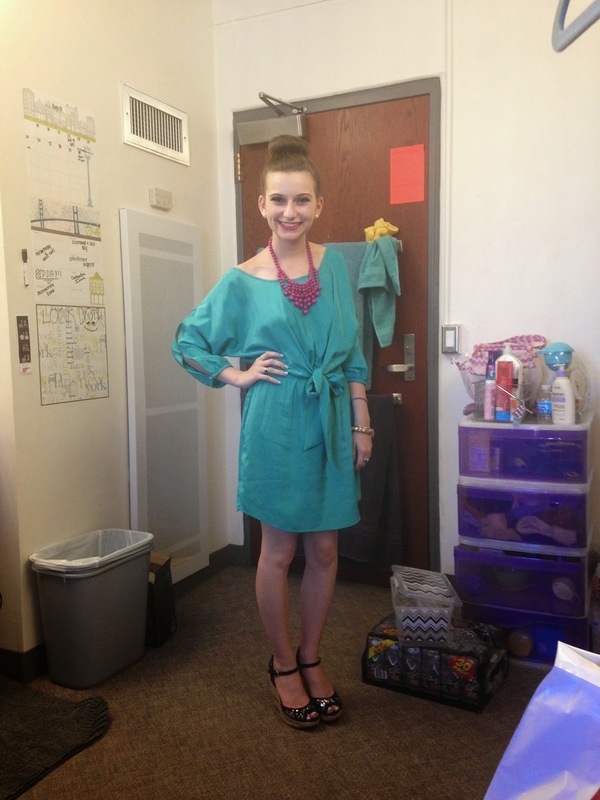 This is what I wore on pref night! I'm pretty sure this was the business casual or professional day. 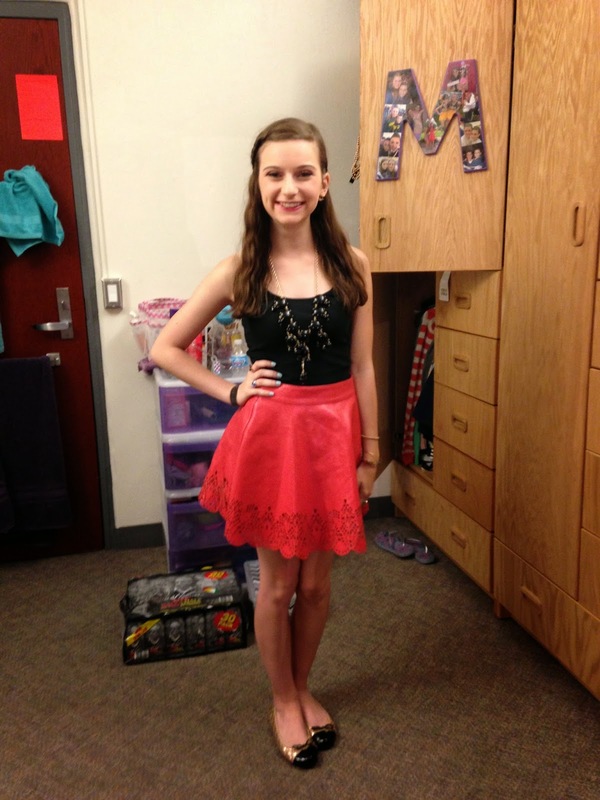 I wore ballet flats to dress up the look a little more. During our Rush it was super hot so they weren't to strict on it being super professional. So, you have all of your rush outfits now what should you bring around to all of your stops during rush week? Well here are a few of my rush bag essentials that I brought or should have brought along. WARNING: Not all houses let you bring bags. When I rushed we all had these totes and we had to leave them outside when we went inside. So, if you don't feel comfortable leaving a bag outside don't bring one. But, they generally don't let you bring your phone inside to a house. (And by generally I mean ever.) It can be nice to have a tote bag to have your phone with you while you wait outside. A water bottle. Like I said before when I rushed it was hot hot HOT outside. And as you can imagine their aren't water fountains in the middle of the Greek community. So, a water bottle is always a nice thing to have. I will say usually the houses will give you water once you are inside. However, you can get pretty toasty while waiting outside. So stay hydrated!!! Snacks. I don't know about you but I am always hungry. Usually you eat breakfast, lunch, and dinner during rush. But, with all of the walking you could potentially be doing you get hungry fast. If you pack a granola bar or a bag of goldfish it could potentially stop a hangry episode. Hangry is hungry + angry and I experience it a lot. So, to prevent yourself from starving pack a quick and easy to eat snack! Face powder. Its great to have this to freshen up after or before each new house. Change in shoes. Midday some people's feet were killing them from their heels. So just bring a comfy pair of shoes to wear if you end up dying. You can always change into your cute shoes for when you go to talk to the girls and wear your comfy shoes when you are walking around. Tip: If they do give you tote bags or draw string bags like this personalize yours so you can find it easier! You can either tie a ribbon on it or write your name on it with a sharpie. 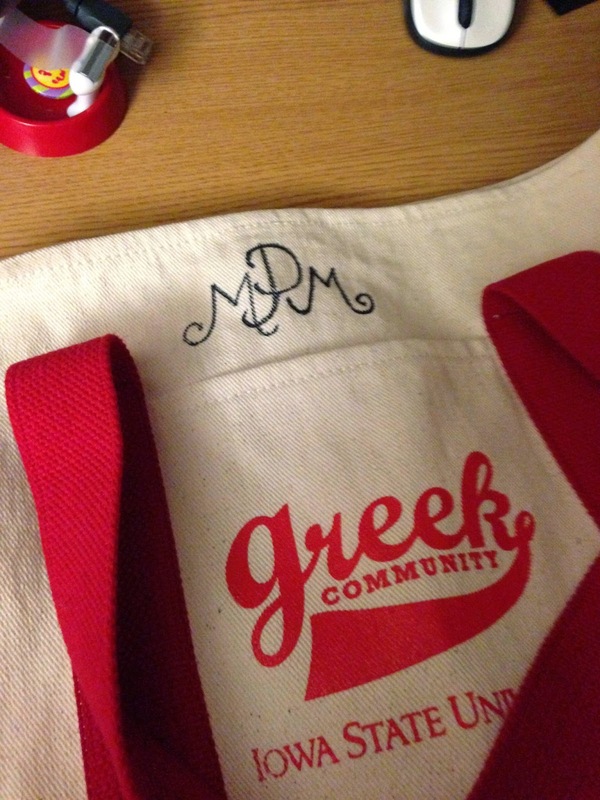 Of course I monogramed mine because I'm obsessed with monograms! Now that you have a run down of what you may expect and what you should possibly wear.....what are some tips to have a successful recruitment and find the chapter that is perfect for you? 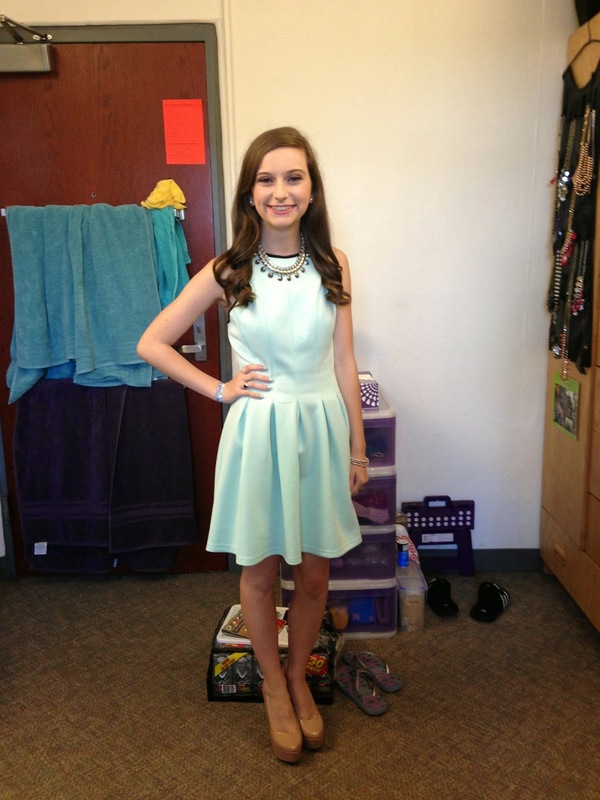 Well, on Sorority Stylista I wrote an article all about my Do's and Don'ts of recruitment! Be sure to check it out by clicking HERE! I love your sock bun!. It’s very pretty and elegant!. You look so cute with it!. It suits you so well!.